"Yo, thank the first band," guitarist Ammo Diaz told Humanity Falls' frontman as he was thanking all the bands who played Lit Lounge on Dec. 7. "I just did, pothead," vocalist Eston Browne said in his defense. The two of them played from the floor in front of the stage, where the band's bassist and drummer resided for the entire show. In between each song, they picked out friends from the crowd to thank. But it took them some time to find each person, because neither of them were wearing their glasses. 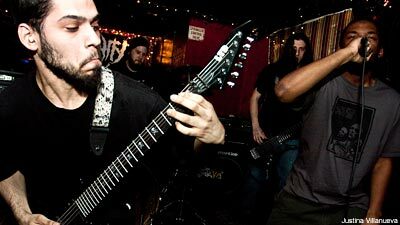 As stated on their MySpace page, Humanity Falls get their sound from a combination of Gorguts, Morbid Angel, Immolation and a slew of other old-school New York death metal bands. But what they forget to say is that the band does so with conviction and some really interesting parts. Their creative mission is to revive a local death metal scene, and they insistently do so by attending as many basement-centric shows as this Noisecreep writer finds herself at. Humanity Falls will be opening for Krallice, Crucifist and Ancient Wound on Jan. 10, when the four bands play Brooklyn's Knitting Factory. Crucifist, which features Brutal Truth's Dan Lilker, makes some wintry, new wave of British heavy metal-driven black metal. The band's latest release, 'Demon-Haunted World,' is available via Profound Lore. And if you live on the East Coast, you can catch them on the road when they pursue a mini-tour from Cleveland to Massachusetts in the bitter beginning of January.